There's nothing as quick and festive as a Chunky Bloody Mary Soup --served cold-- for an elegant Sunday brunch or Fall tailgate party (and delicious too). Unlike most, this recipe is chunky not smooth which makes it extra tasty. (Since I had recently attended Muir Glen's "Vine Tasting Tour" chef extravaganza down at Astor Center in New York City -- full disclosure-- I had a gift of four cans of Muir Glen organic tomatoes, including two cans of "limited edition 2010 reserve" Meridian Ruby diced tomatoes and a lot of inspiration from the chefs. 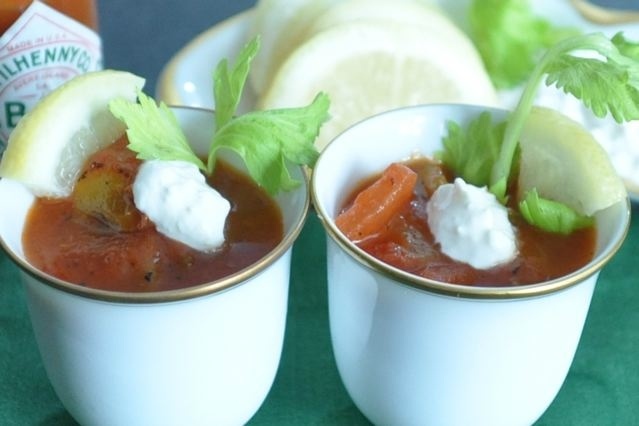 This recipe includes all the ingredients in a Bloody Mary cocktail plus a dollop of homemade horseradish sour cream. The size of the diced celery should be about 1/4" or slightly smaller than the canned diced tomato pieces. Instead of tomato juice and fresh peppers, I made my own tomato juice in the blender -- medium speed for 30 seconds -- using 15 ounce cans of tomato sauce and chipotle seasoned diced tomatoes (including the liquid). Thick and flavorful and just the right consistency for the soup base. 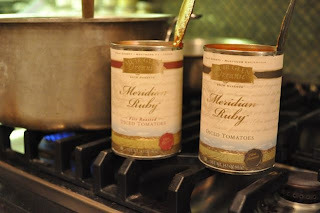 I made the soup puree out of the traditional Muir Glen organic tomatoes and sauce and saved the limited edition reserve (2010) for the "chunks" -- one 15 ounce can each of Meridian Ruby Fire Roasted Tomatoes and Meridian Ruby Diced Tomatoes. The soup cooks for a total of 15 minutes and added the vodka during the last five minutes. 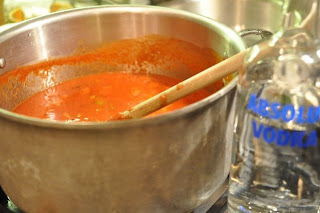 At the last minute, when the soup was cooled, I decided to add 3 tablespoons of uncooked vodka and the juice of a whole lemon (so it had the vodka and lemony taste of a cocktail) without the buzz). Chill and serve. Garnish with fresh horse radish and sour cream, lemon, celery or get creative and use pickled green beans or other pickled. Serve Tabasco Sauce on the side for the adventurous! 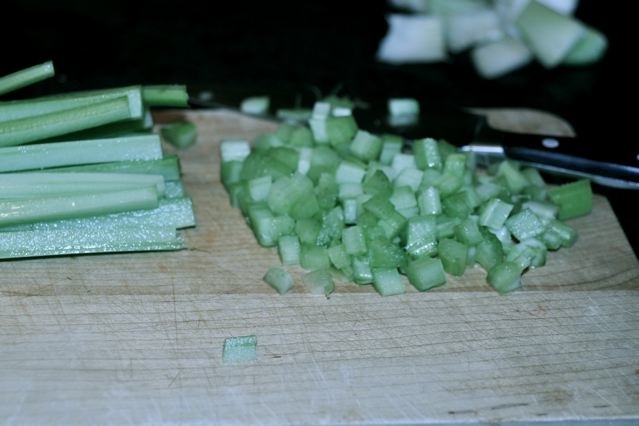 In a soup pot, saute celery in olive oil for 10 minutes until tender. 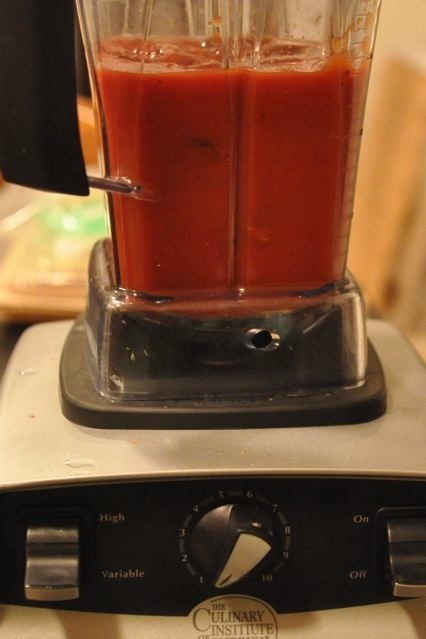 In the meantime, blend the tomato sauce and diced chipolte tomatoes on medium speed for about 30 seconds until smooth. Add to soup pot along with the two cans of diced tomatoes, including liquid. Cook for 5 minutes on medium heat. Add lemon zest, Worcestershire and Tabasco sauces, and chicken broth. Cook 5 more minutes. Add vodka. Cook 5 more minutes. Let cool. Stir in additional vodka and lemon juice, and refrigerate until ready to serve. 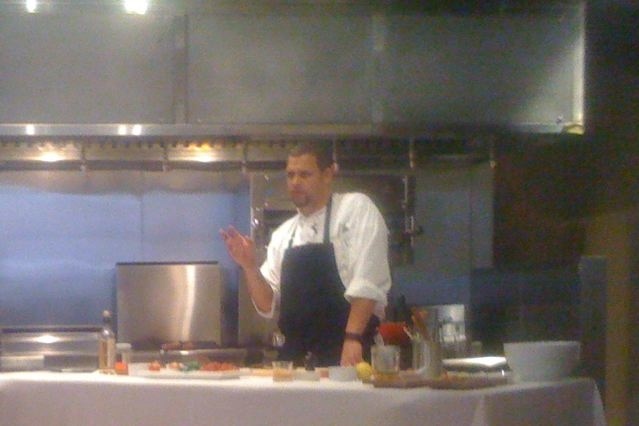 Garnishes may be prepared up to several hours before serving. 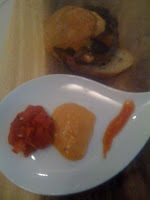 I rarely cook with canned foods, preferring to use homemade stocks, fresh vegetables and the like. But for some ingredients I prefer canned or frozen over "out of season/fresh" shipped from far away lands when I can't get an item I need at the farmers market and my freezer supply has dwindled. Canned organic tomatoes are one of those ingredients (so are other organic products such as canned beans, frozen fruit, corn and lima beans). As far as canned tomatoes are concerned, as a locavore I prefer Muir Glen brand for two reasons: one, they are organic and two, they are grown in California. While California is not exactly "local", it is "more local" than Italian grown products (most high quality carton or canned tomatoes are made in and shipped from Italy) and Muir Glen uses sustainable farming practices. 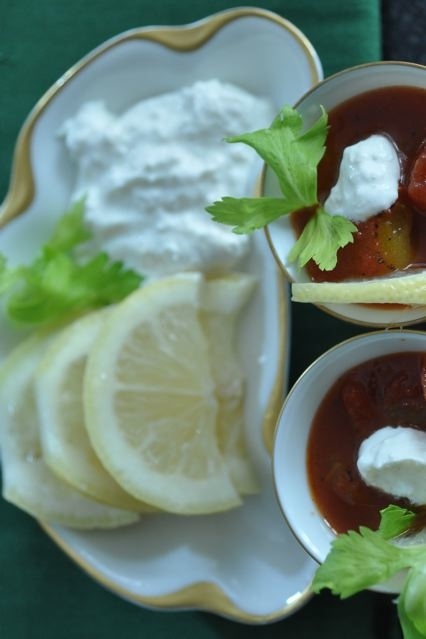 The Meridian Ruby's that I used in this recipe are a special edition of Muir Glen brand tomatoes which are hand-harvested and canned within 8 hours. 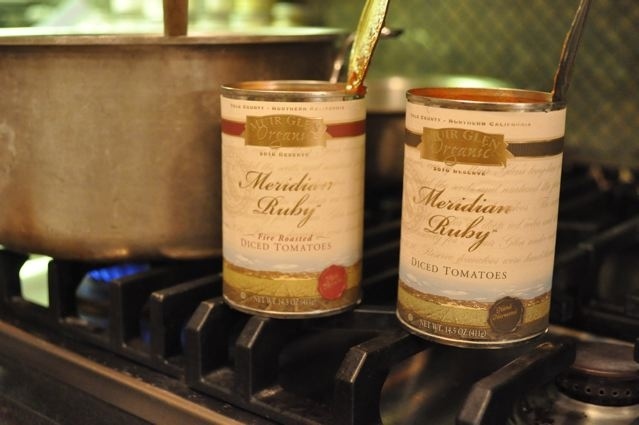 Later this month and similar to a wine club, Muir Glen's Small Planet Foods, the makers of Meridian Ruby reserve tomatoes, will release the 2010 limited edition harvest to members of their Tomato Connoisseurs' Club. (NOTE: You can buy a reserve kit beginning November 15 for $8 including shipping). As a club member, you'll also receive a Tomato Vine Dining Tour recipe booklet which includes all the lunch items I tasted at the "Vine Dining Tour" Launch event. My favorite recipe in the booklet is the Fire Roasted Tomato Burgers with Aioli Sauce, Sweet and Sour Sauce and prepared by Chef Scott Pampuch of Corner Table restaurant in Minneapolis. looks delish! BTW, I work for a company called www.bitehunter.com. We are the web's first real time dining search engine, and have all dining info from thousands of restaurants' tweets, blogs, websites, as well as all dining deals from daily deal websites. Check us out! BiteHunter that's great. 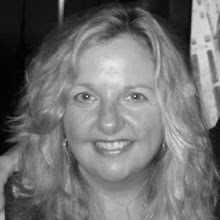 I hope you'll include some local blogs and locavore recipes too!